42" x 60" x 1.50"
Jaoui's compositions are built on an intuitive and unconscious process. 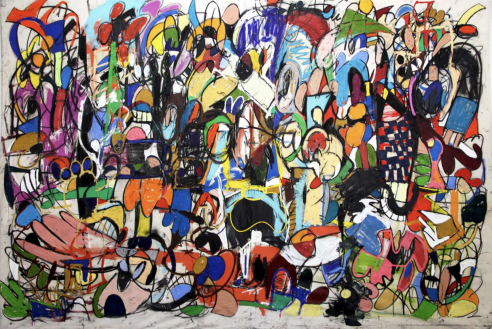 He uses different sources of inspiration, spanning from cartoon and graffiti-like drawings to Abstract Expressionism and also Primitivism movements. Jaoui's work joins together painting and drawing, between abstraction and representation. Through a personal language in his compositions, he aims to stimulate the viewer's feelings and imagination and let him build his own interpretation of the picture. His often composes with semi-figurative elements, such as heads, bequests, eyes or hands. He combines an aggressive use of color and texture with various combinations of oil, enamel, spray paint and charcoal on canvas. Taher Jaoui was born in Tunis, Tunisia and currently lives and works in Berlin. His work is part of several private and public collections around the World.